Aloe Sensitive Cleansing Gel refreshes the skin during cleansing and alleviates irritation. Aloe Sensitive Cleansing Gel refreshes the skin during cleansing. It contains Aloe Vera Leaf Juice to reduce irritation. The delicate, foamy consistency is suitable for cleansing both combination and oily skin and is also good for sensitive skin. 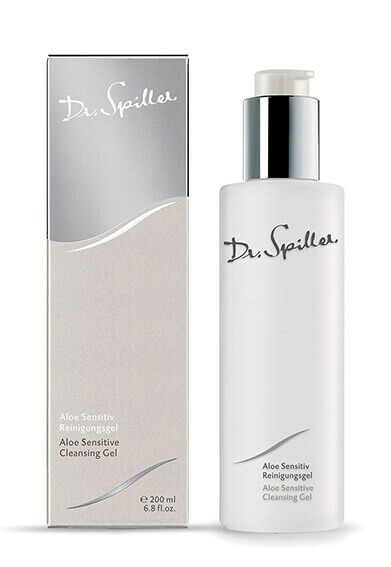 Use Dr. Spiller Eye Make-up Remover to remove eye make-up, if needed. Work a hazelnut-sized amount of Aloe Sensitive Cleansing Gel into a lather between the palms with a small amount of water, apply evenly to face, neck and décolleté, and then remove using lukewarm water. Finish by toning the skin with appropriate facial toner.